The high street has been invaded by polka-dot prints. Last winter you'd be forgiven for thinking that the dotty obsession would be settling down, but this year, a polka-dot Topshop dress caused what we can only describe as fashion panic. It's a silky white dress with a V-neck front and back made of two clashing polka-dot prints. With mixed prints, ruffles and a "how do I wear a bra with that?" neckline, it might sound like a tricky purchase, but somehow, it works perfectly. The dress has been re-stocked countless times now, and each time has sold out as soon as it went online. Topshop released a similar version in reverse (white spots on a black background), which also sold out almost instantly. This month, however, the store sent us all into a shopping frenzy once more with a new addition to the lineup (which already includes zebra print, on-trend scarf print design, plus a retro floral take): Snake print. We'll be wearing ours layered over a roll neck jumper for extra warmth. Keep scrolling to see and shop the cult Topshop dress. Style Notes: Topshop's pinafore dress now comes in snake print. Wear with a polo neck knit layered underneath for autumn. Style Notes: The cult Topshop pinfore dress just got a floral update. Style Notes: Ellie wears the Topshop polka-dot dress with gold hoops and a red Staud bag. 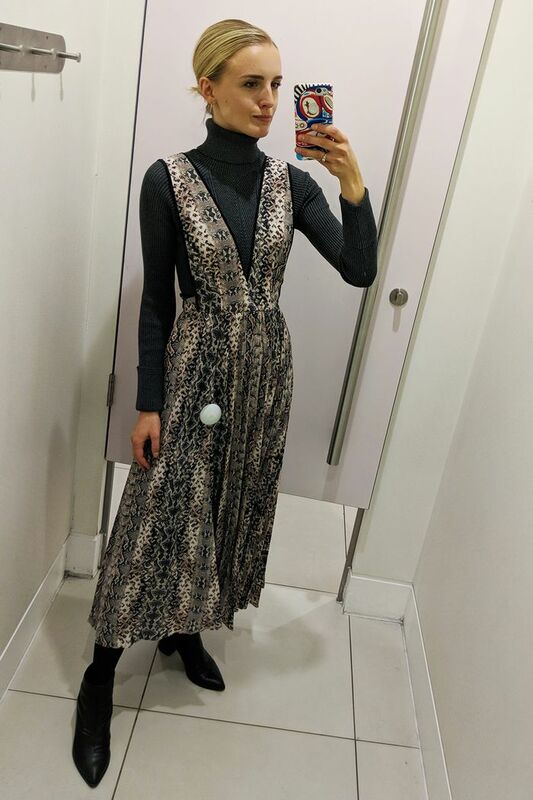 Style Notes: The neckline might be a little low, but Erica makes it a dress you can wear with a bra without even having to think about it by layering a white lace high-collar top underneath. Style Notes: Topshop stylist Amelia shows this is perfect for the evening, pairing it with black high heels. Topshop's cult dress meets snake print (aka a match made in heaven). The dress is back—this time in a vintage-looking floral print. There's also a sandy take on zebra print. Scarf prints are set to be big news for autumn, which makes this an even savvier purchase. The cult pinafore dress in a new blue stripe version. Anyone else want them all?